The Weslo Pursuit CT 3.8 R recumbent bike is the cheapest recliner bike on the market but does have some potential if you only need it for light use. The LCD display monitor shows your feedback for speed, time, distance, calories burned, and pulse. The console is powered by 4 AA batteries to light the display. UPDATE: The Pursuit CT 3.8 R has been discontinued. If you're interested in buying a Weslo exercise bike check out the selection of popular models on sale at Amazon. Features on the Weslo Pursuit CT 3.8 R recumbent bike include a easy entry step-through design, an RPM meter to track your pedal revolutions per minute, and a Target Pacer indicator light to let you know when to slow down or pick up the pace. It also includes an adjustable seat, transport wheels, and two pre-set Pacer Workouts that can signal you to work harder in the target zone for better results. The heart rate monitor on this model is inaccurate most of the time, the resistance is rather light, and the seat is uncomfortable as well as hard to adjust the slide mechanism. Another drawback of the Weslo Pursuit CT 3.8 R: If you have long legs, it is possible to hit your knees on the handlebar with the upstroke of the pedal. Reviewers have a few favorable points to mention, such as it is easy to assemble and is remarkably quiet. 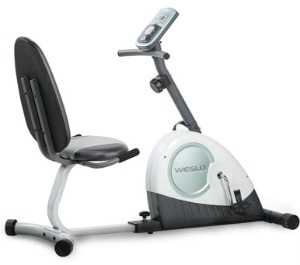 If you need a cheap recumbent bike for warm-ups only, or if you need Physical Therapy on an easy resistance bike, the Weslo Pursuit CT 3.8 R could work well for you. However, if you are hoping to pursue indoor bike riding for the long term, your best bet is to invest in a better quality bike rather than buy a new cheap Weslo every year or two. If possible, don’t bother with the Weslo Pursuit CT 3.8 R recumbent bike. Like most of the other Weslo bike products, buy this bike only if you don’t expect much quality and you realize you will have mechanical issues to deal with. Better recumbents that sell for under $200 include the Stamina Magnetic Resistance (although those bikes are a better fit for people with longer legs), and the popular Marcy Recumbent Bikes. All of those models get very strong reviews from satisfied users.